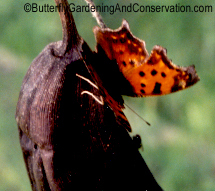 Comma feeding from a banana. Commas range over most of the eastern US. Host plants include Elm trees, False Nettle (Boehmeria cylindrica), Stinging Nettle (Urtica dioica) and Hops (Humulus Lupulus). Eggs light green, laid singly, underneath host plant leaves. Caterpillars feed at night. Adults hibernate in winter. Adults feed on sap and rotting fruit and rarely flowers. Easy to attract to hanging rotting bananas. 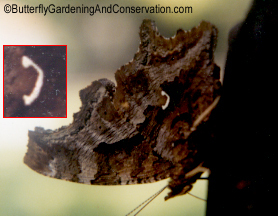 Commas are named after the silver/white marks on the outsides of their wings. Commas from side. 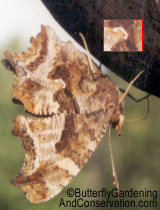 Red boxes show close-up of 'comma'. 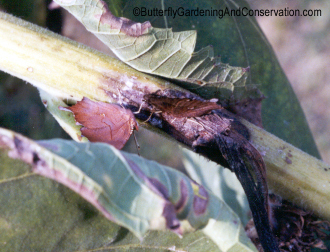 Question Mark and Comma feeding from rotting stem of sunflower.